Bring cocktail hour to every hour with this ultra-glamorous statement ring in sterling silver. The beautifully crafted teardrop shape and faceted stones will light up your fingers gloriously. Available online or in-store. 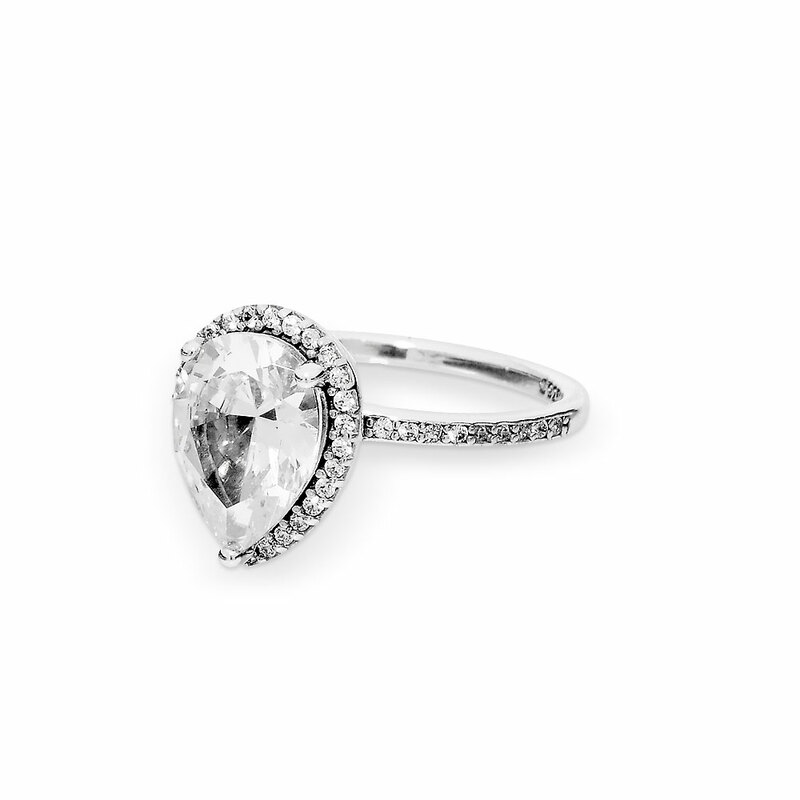 Radiant Large Teardrop Ring is rated 4.6 out of 5 by 213. Rated 5 out of 5 by Sophieeeeeeee from BUY THIS NOWWWWWWW I bought this yesterday... I DONT EVEN HAVE A BOYFRIENDDDDDDD.... I just love myself and believe in spoiling myself if you want a ring that shines and sparkles EVEN IN THE DARK I highly suggest you buy this!!!!!! Rated 5 out of 5 by SarahJayne from Beautifully Distracting! When I saw this on the website, I was obsessed! I immediately went to the mall to see if it was there...and it was! I pawned off the promise ring my ex gave me 2 years ago and bought this to replace it. This was cheaper in price than the old worthless promise ring. You’ll definitely get noticed when wearing this, especially in direct sunlight! I get distracted by it all the time and it’s a bit larger than what I’m used to but I don’t mind. If you’re unsure about getting this, go into your local Pandora and try it on for yourself. That’s what I did and I’m in love! Rated 5 out of 5 by Allykittenn from So pretty It looks great on! I didn’t think it would look so real but it does!! Rated 4 out of 5 by Lizzythehuman from Beautiful I admit i was a little skeptical about this but honestly it did not disappoint. I can’t stop looking at it. My only concern is that I am normally a size 5.5 but ordered a size 6. It is slightly big but I purchased a ring adjuster which in the end worked out fine. I wish Pandora had half sizes. Rated 1 out of 5 by Tina N Marie from Absolutely Beautiful, but disappointed My husband just bought me this ring for my birthday and I haven't even had on for 24 hours and one of the stones came out already. I'm so sad because I love this ring and researched for months for the perfect ring. This is my first purchase with Pandora and although I have the one year warranty, something tells me that I'm going to keep having this problem even though I take care of my jewelry...I'm so dissatisfied.